I’m not a big fan of this movie, great cast but I really can’t get into it. You would think with a cast of Joan Crawford, Norma Shearer, Rosalind Russell, Paulette Goddard, and Joan Fontaine, it would be great, but I find it boring. As for Ms Natalie Moorhead, I have no idea where she is in this movie, imdb says she plays “woman in salon”, thanks, that helps. Around this time in her career she became a brunette in hopes of getting better roles, so I thought I found her and I was very excited. It was around the fashion show scenes, she even had a few lines, but the more I watched those scenes, I said to myself, that kind of looks like Aileen Pringle, another favorite of mine. When Natalie became a brunette, she did look a little like Aileen, so I looked up the cast list on imdb and to my disappointment it was Aileen Pringle, well back to the search. 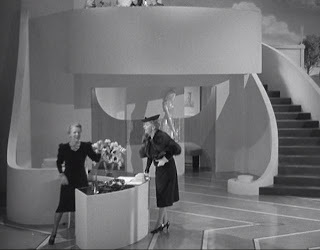 I still can’t find her, there is a little scene that I think is her, early in the movie there is a wide shot of the salon, and the receptionist gets up and shows someone around. Now the woman is blonde and does look like her, but Natalie should be a brunette at this time, but maybe the brunette hair was really a wig, wigs were very popular at that time, also it does kind of sound like her, but I’m still not sure. Maybe I’m missing her, maybe she’s right there in my face but I still can’t for sure find her, if anyone knows where she is, I would love to know.